This refreshing beverage contains only 150 calories. Lighten up calories by reducing sugar and adding fruit. 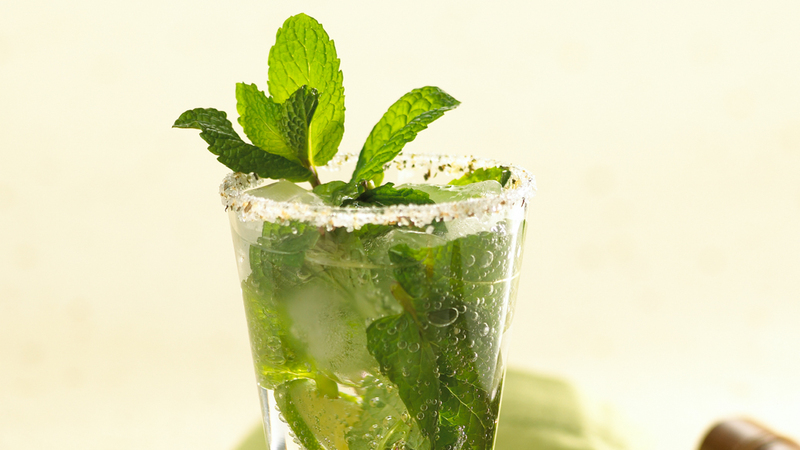 Moisten rim of a tall glass with one lime wedge and dip into Mojito Rim Trimmer™. Gently rotate to evenly ‘frost’ rim. Place mint in glass. Cover with sugar and lime juice. With the back of a spoon, lightly crush mint. Fill glass half-full with ice. Add rum, fill with club soda and stir well. 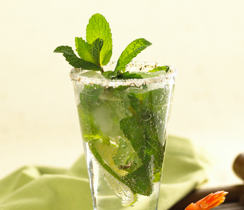 Garnish with remaining lime wedge and sprig of fresh mint. Serve. Tip: To make alcohol-free Epicure Mojitos, replace white rum with additional lime juice.Infuse with fresh berries or cucumber for a delightful twist.